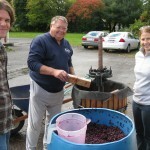 After crushing and de-steming the grapes, yeast is added to the mash and fermentation begins. The grape skins rise and would dry out if they weren’t punched down twice each day. About a week after primary fermentation begins, the grape juice is pressed from the skins and the juice continues to ferment in airtight containers.Â After about a month or so, the juice will be ‘racked’ to separate the juice from the ‘lees’ (sediment). 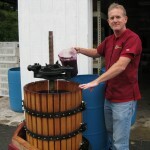 This will continue for more time, then racked again to separate the sediment from juice.